What’s better than a super easy bowl of pasta with all the delicious flavors of enchiladas? Working for a living, being a spouse, a parent and a gym rat (not necessarily in that order) can have it’s challanges. Because my schedule gets so tight sometimes, I take advantage of doing food prep on the weekends. It saves me mad time during the week. With just a little bit of planning and a few hours of cooking you can pre prep a lot of stuff that’ll just be waiting for you in the fridge all week. Who doesn’t want that? This recipe is perfect for weekend food prep. You can get it in the oven in under 20 minutes and it keeps really well in the fridge or in the freezer. You can also put this together in no time on a busy weeknight when you are getting home late and don’t have a lot of time for cooking. You can easily make it gluten-free with your favorite gluten-free pasta. I don’t know about you but sometimes my schedule gets so busy that I can’t even fathom how I am going to fit everything in. Usually I end up having to figure out how to prioritize things and leave some things behind. Life is just like that! We are constantly juggling what we wish we could get done with what we must get done. Spring Break this year was spent traveling with my daughter out to the midwest for a quick trip to see my Grandma and then back home to California and a road trip down south to tour a few colleges. It was incredible first seeing family, and then seeing my daughter start to dream about her future place in the world. It really causes me to take a pause and just breathe in the moment – it will all speed past me before I know it. 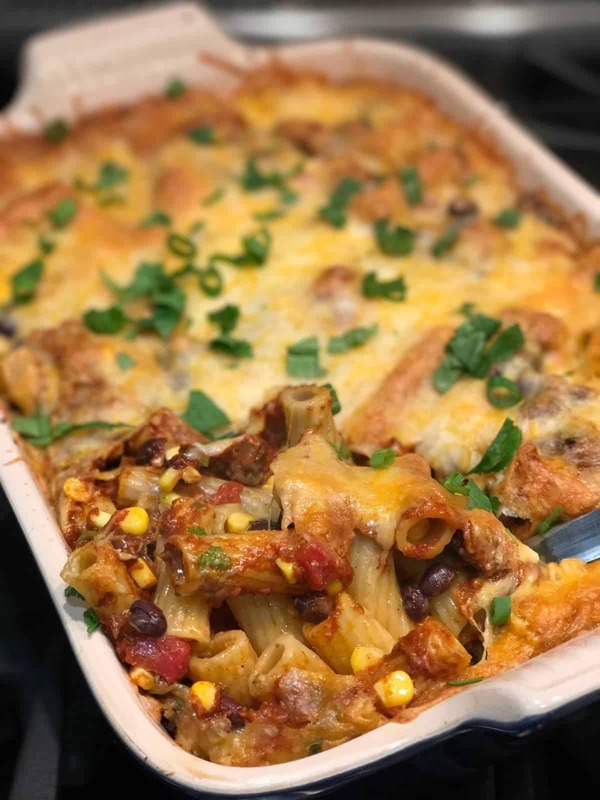 These weeks are the times when I need an easy week night dinner like this enchilada pasta bake. 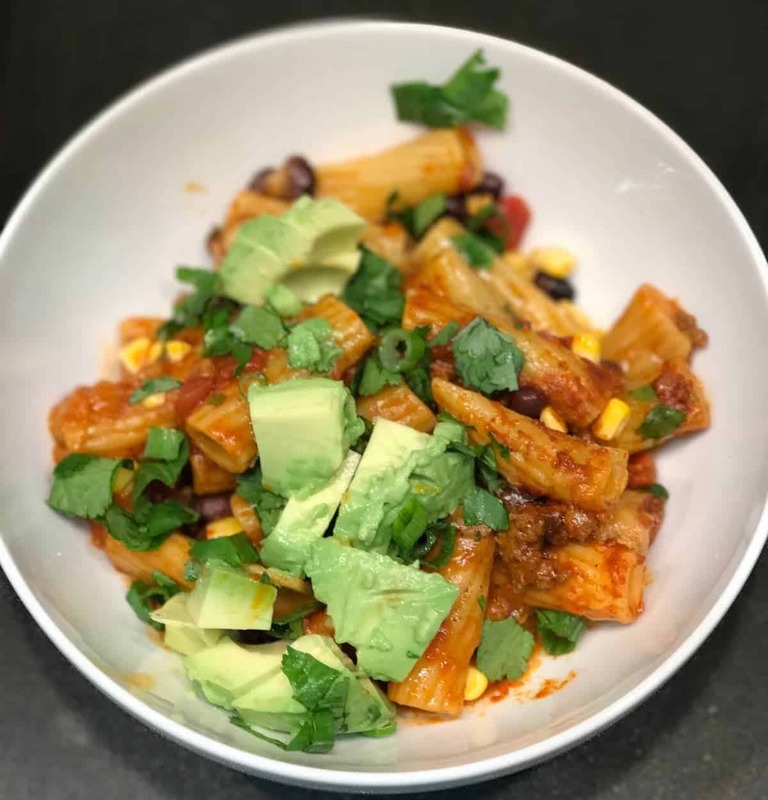 This enchilada pasta reheats really well and tastes just as delicious as leftovers. I usually try to pre-cook a few different proteins on the weekend so that I’ll have them ready to re-heat or use in a recipe like this. I might already have chicken or ground beef cooked and waiting in the fridge. Then I will make tacos or a beast bowl or a salad topped with my protein. If you already have a batch of ground beef browned up with some onions and salt and pepper, you can heat it up in a pan, add a little taco seasoning, and bam you have a really flavorful protein to use. This enchilada pasta is also really delicious with chicken – if you already have a batch of chicken thighs or breasts pre-baked and ready to go, you can can chop or shred them and add your taco seasoning to the meat, and use it in place of the ground beef. I like to make my own spice mixes and keep them on hand. Having a few go-to spices on hand allows you to add a lot of flavor to whatever you are cooking really easily. This taco seasoning is great on chicken, beef, or peppers and onions if you are making veggie tacos. I also use it in my tortilla soup recipe and my 5 Alarm Fire House Chili. 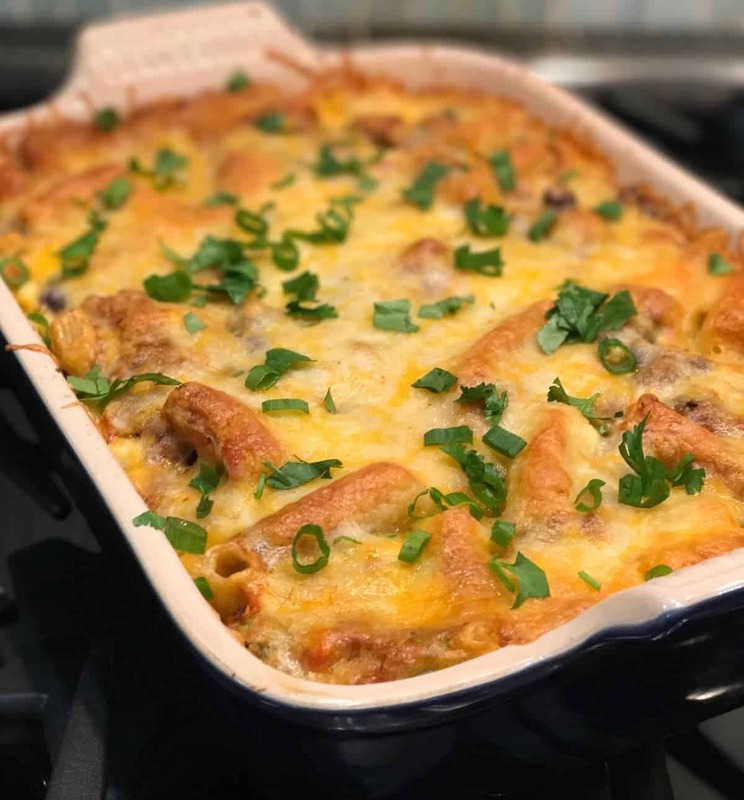 All the flavors of enchiladas in a quick and easy pasta casserole that you can throw together in less that 30 minutes. This recipe makes 8-10 servings. Cook pasta, a few minutes less than directions say. It should still be slighty undercooked. Drain. Set Aside. Prepare baking dish by adding ⅓ of the can of Rotel tomatoes to the bottom of the dish. Prepare mixture in a large bowl. Drain black beans and Rotel tomatoes. Add to bowl. Add the cooked and seasoned taco meat. Cut corn kernels from cob, place in a large bowl. Add pasta and 1⁄2 of cheese. Add 1⁄2 bunch of cilantro, chopped. Add 1⁄2 bunch of green onions, sliced. Use a large spoon to mix the ingredients together. Spoon mixture into the casserole dish and add remaining enchilada sauce on top. Add remaining cheese on top. Bake until cheese is melted and lightly golden brown, roughly 20-30 minutes (depending upon the depth of your pan). Serve topped with green onions, cilantro, and avocado. Make it faster tip: This recipe is super fast and easy if you have pre cooked your meat. I like to have browned ground beef and onions in the fridge ahead of time so that I can make things like this when I am short for time. For Corn: Alternatively use 1 cup of frozen corn or 1 can of corn, drained. For the taco meat: Alternatively you can use diced or shredded chicken with taco seasoning. Gluten Free? Just use gluten free pasta. Looks delicious! Will have to try this soon. Looks delicious! Looks like an easy meal this week!!! Let me know how it turns out. 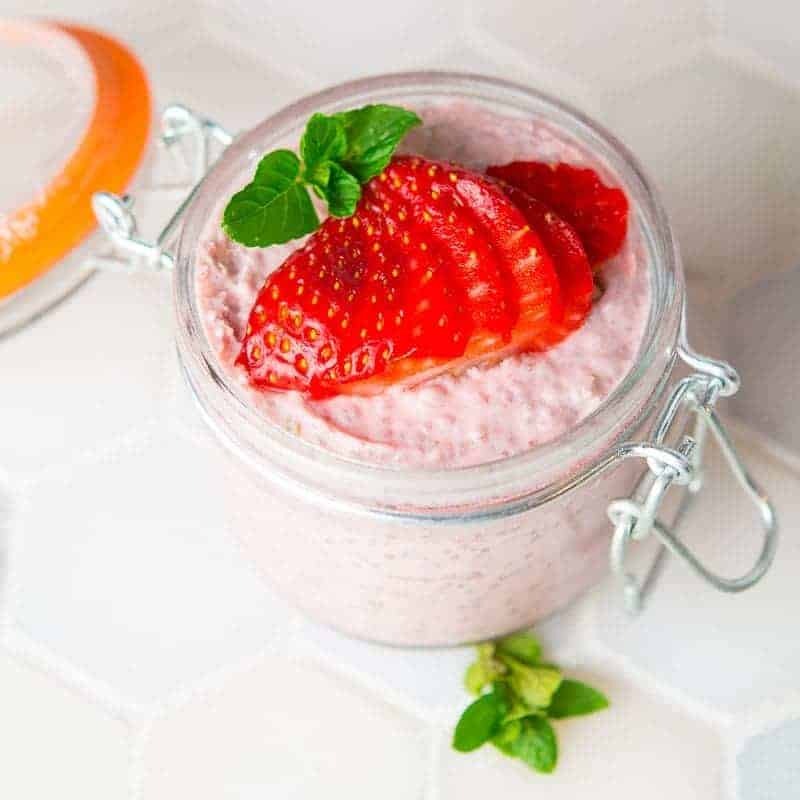 It is super easy and yummy. Interesting idea. I wonder if anyone makes a pasta that contains some nixtamilized corn to give it that special corn tortilla flavor? That’s a fantastic idea for a pasta. Like a marriage between Fritos and orcchiette.